Messages : 12573 Here it is! Cairo-Dock / GLX-Dock 3.1 is now available! The Cairo-Dock team (Fabounet, Matttbe, plus all the people who contributed with patches, bug-fixes, ideas and themes) is proud to announce the release of Cairo-Dock 3.1. All configuration windows have been merged into a single one. The Music Player applet can control players in the systray. Printers-Menu: it shows active print jobs. and Sync-Menu: e.g. on Ubuntu 12.10, it collects status information data from processes that involve some form of synchronisation with servers; such as about apps like Ubuntu One. The dock now supports XRandr which should replace Xinerama and help the dock to manage multi-monitors. Progress bars can now be customised (in the advanced mode of the configuration panel / 'Indicators' module). We can drop .sh files into the dock to quickly create a new launcher. The "Lock icons position" now only block the icons position but we can still add new launchers/files from the menu/file manager. QuickList menu entries are now translated if it's available. We can now launch the dock with '-W' (--metacity-workaround) option which is a workaround for window managers (e.g. 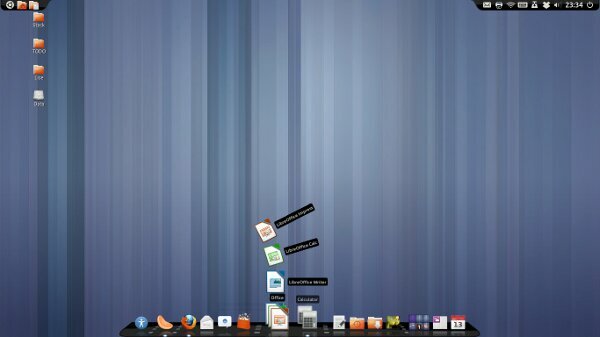 Metacity) not handling the opacity correctly (if your subdock/dock/dialogues are invisible). Window's actions have been merged into a single menu entry (right-click menu). The default view now use all the screen space to avoid the jitter of the dock when it is resized (visible only if your window manager doesn't resize it correctly). Labels in vertical dock now ends with a gradation. The dock now supports animated images with variable rate (have a look to the new 'Busy' animation when the Weather applet is downloading data or when you're uploading files with the 'Drop to Share' applet). Clock: We can now easily add a new task by doing a right click on the calendar. Drop to Share: Supported text files (now it uploads the content of text files to servers like pastebin). Applications Menu: used gio to launch the menu entries, so that the event is stored in Zeitgeist. Mail: Improved the look of the icon and its dialogue. MusicPlayer: Prevented displaying quicklists, since the applet already provides all the common actions for any player. Notification Area: displayed the title, the label and the description (if they are available) on the label of the icon. PowerManager: displayed the details of all batteries (and not only the first one) and modify the icon if the battery is removed/added. QuickBrowser: Added drag support (e.g. to quickly drop file into GMail in order to join this file to the mail). Recent-Events: prevented double entries in the menu list and unavailable files. Recent Events: added recent applications. Stack: it now supports all URI extensions, not only files from the file system but also files from servers or even from the trash. Switcher: Added new options and modify the lists of options. Now we can have a very simple drawing (like Swichter applet of the Gnome-Panel). Added an option to have progress bars in a few applet (Sound Control, Wifi, PowerManager, etc.). A new 'third-party' applet is available: YoutubeDL to easily download Youtube videos (thanks to Brian). Twitter applet now supports Identi.ca (thanks to Eduardo). 3 new themes are available. The code has been cleaned in order to remove most warnings when we compile it with -Wall (and -Wextra for the core). Translations have been updated. Thanks to all contributors (from https://translations.launchpad.net/cairo-dock). !!! N'oubliez pas le Filtre anti-spam !!! un petit problème toutefois: j'utilise Ubuntu 12.10, je l'ai chargé dans une session gnome et il ne s'est pas intégré dans Unity; comment faire pour qu'il soit aussi intégré dans Unity ? je l'ai chargé dans une session gnome et il ne s'est pas intégré dans Unity; comment faire pour qu'il soit aussi intégré dans Unity ? Une meilleure intégration d'Unity signifie un meilleur support des outils développé pour Unity (donc on peut avoir les info visibles dans le dock et la barre d'Unity dans le dock comme les menus QuickList, des indicateurs du nombre de mises à jour à faire, le menu pour les impressions, la zone de notification, les notifications des messages, etc. Bref, ce que l'on peut voir sur le screencast ci-dessus ). Cependant, le dock peut aussi fonctionner avec Unity en démarrant la session Ubuntu puis en lançant le dock. Est il possible de retrouver dans cet environnement Cairo-Dock+Gnome la fonction de Gnome qui permet en amenant le curseur de la souris en haut à gauche de réduire et de voir d'un seul coup toutes les fenêtres ouvertes? C'est la seule chose qui me manque dans Gnome. Messages : 1635 Tu as un applet ("sélecteur de bureau", mais malheureusement pas pour "montrer le bureau" ) qui te permet de lancer "exposer des fenêtres" de compiz (l'effet que tu décris) au clic. Mais tu peux aussi bien installer le config compiz system manager (CCSM, indépendant de cairo-dock) et retrouver le comportement d'apparition via le coin de l'écran. Merci de ta réponse. Saurais tu quelle est la fonction de CCSM qui permet de gérer les fenêtres par le coin de l'écran ? Ça m'éviterait des manipulations hasardeuses. Messages : 12573 je crois qu'il faut regarder à la configuration du plug-in Échelle de Compiz via le ccsm. I'm a spam! Now I say: Thank you for this new version! Messages : 1 Ignore me, I'm a spam!